Summary: To solve Rhode Island's budget crisis, the state's colorful governor, Attila the Nun, wants to legalize sports gambling; but her plan has unexpected consequences. Organized crime, professional sports leagues, and others who have a lot to lose--or gain--if gambling is made legal flood the state with money to buy the votes of state legislators.Liam Mulligan, investigative reporter for The Providence Dispatch, wants to investigate, but his bottom-feeding corporate bosses at the dying newspaper have no interest in serious reporting. So Mulligan goes rogue, digging into the story on his own time. When a powerful state legislator turns up dead, an out-of-state bag man gets shot, and his cash-stuffed briefcase goes missing, Mulligan finds himself the target of shadowy forces who seek to derail his investigation by destroying his career, his reputation, and perhaps even his life. The governor of Rhode Island has a plan to propose legislation to use legalized sports gambling as a means to offset budget deficits. The plan attracts several interested outside parties such as amateur and professional sports leagues, current out-of-state sports gambling sites and organized crime. All these special interests are pumping substantial money into Rhode Island to influence the outcome of the legislation. Liam Mulligan is an investigative reporter for The Providence Dispatch, a Rhode Island newspaper that is a shadow of itself under its new owners who appear more interested in profits than in running a good newspaper. Liam is asked to investigate two recent deaths, one a body fished out of water and the other a body found in a small plane crash. Liam, working against the directive of his editor, soon links the bodies to the recent proposal to legalize sports gambling. Of interest is the fact that the governor is an ex-nun and a personal friend of Liam. As Liam continues the investigation against the newspaper’s wishes, more people turn up dead and Liam becomes a prime suspect. At the same time outside forces are working to derail his investigation and ruin his reputation as a reporter. 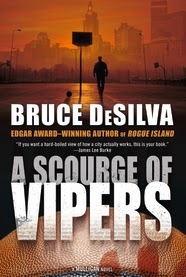 In A SCOURGE OF VIPERS author Bruce DeSilva writes a terrific mystery novel that combines a great plot, great writing and great characters with a lot of fast-paced action. DeSilva also uses the novel as a social commentary on the sad state of daily newspapers and the influence of outside money in corrupting the political process. If you are a fan of mystery novels then you will definitely enjoy A SCOURGE OF VIPERS. Thanks to the publisher for providing a review copy of this novel and to Booking Pap Pap for his great review.